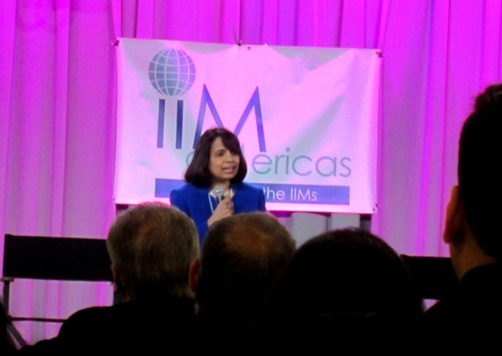 The organization’s come a long way since its founding less than ten years ago, as President Ashima Jain pointed out in her address, “Exciting Times.” The name has been changed from IIM USA to IIM Americas to recognize our Toronto chapter. We’ve 13 chapters in America, and ties to overseas alumni organizations – including one in Singapore that I remember fondly. Ashima deserves a lot of the credit – despite working full time for Price Waterhouse Coopers, her energy and vision have made this organization flourish. Unlike the institutes themselves, whose value comes in part from their exclusiveness, IIM Americas tries to be inclusive. India now has 13 IIMs – up from three when I graduated! Most IIM alumni organizations tend to be institute-specific, and remain small. Even IIM Kolkata, the oldest of these institutes, has a small graduating class; and the newest ones have very few alumni, because they’re new. Having a pan-IIM alumni association made all the difference – it now has 7,500 alumni as members, from all of the IIMs, old and new. At Pinnacle, we missed the breakfast meeting on mergers and acquisitions – too early and too far for me, particularly since my interest in the topic is largely academic. 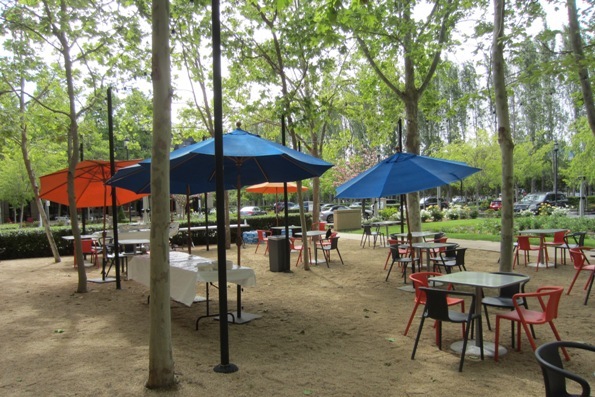 The conference was at the Googleplex in Mountain View, a good hour’s drive from home. Ro Khanna, who’s running for Congress in California’s 17th Congressional District, spoke about the need for an honest and nuanced conversation about jobs and the global economy. People don’t want jobs going overseas, but also want the lower prices from “Made in China.” A US-made smart phone, for instance, would cost around $2300. Also, technological change is a much larger reason for job loss on globalization, displacing low- and middle-skilled workers. 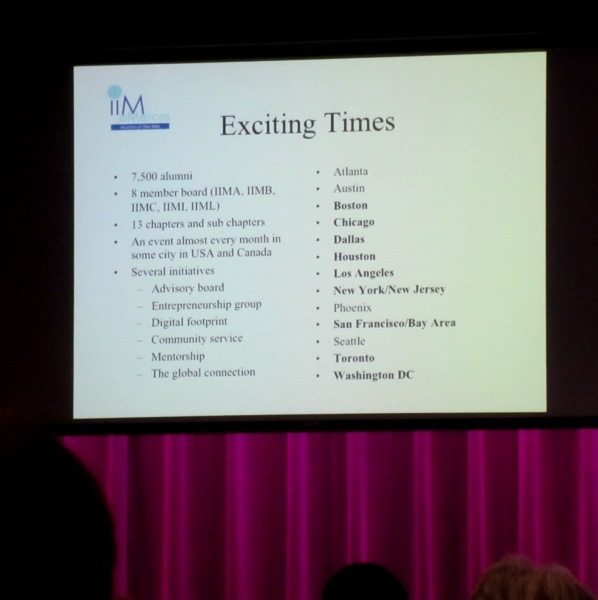 Attending a last-minute meeting in New York, Radha Ramaswami Basu, CEO of iMerit Technologies, gave her talk by video-conference. She was in India with Hewlett Packard years ago, and we were interested to know what she’s working on now. After her 20-year career at Hewlett Packard, she and her husband started a social enterprise called Anudip Foundation to train impoverished young men and women in Kolkata, India, in information technology and micro-entrepreneurship. Then she started iMerit to sell remote IT service to US companies, thus providing jobs to Anudip graduates. Two interesting panel discussions focused on data privacy and on entrepreneurship. Who has our data, and does it matter? Panelists Ankit Jain, (formerly of Google and founder of Quettra Inc), Rachna Choudhry, (founder of PopVox.com, a start-up that helps individuals locate and understand bills before Congress), Lil Mohan, (entrepreneur and technologist); and Ro Khanna all agreed that large web companies like Google, Facebook and Yahoo collected huge amounts of information on everyone who used the internet. After the Snowden revelations, we all know the US government also does. But: so what? There were two interesting and opposed viewpoints. It’s companies gathering data that’s the real problem; they don’t use it for the common good but for marketing, while the government would generally use it to make us safer Vs: It’s legitimate for companies to gather data about their clients as they’ve always done; but the size and power of the government that makes possible misuse of data both tempting and downright dangerous. “People are willing to sacrifice data privacy for security,” commented the person sitting beside me. But my experience is that it doesn’t even take that. People are willing to sacrifice data privacy for convenience. Everyone on the panel favored more transparency about what data was being collected, by whom, and how it was being used. But even if all that information were available, I suspect most people won’t bother checking. What makes an entrepreneur succeed? Dr Ram Nidumolu (entrepreneur, author and academic), Mehul Nariyawala, (“Serial entrepreneur” and now at Google after his company got acquired), and Doc Vaidyanathan, (VP at CA Technologies) talked about what qualities an entrepreneur needs. A willingness to take risk is the most important, and one suggestion was to start something early before you’re embedded in a cushy job, with a family and a mortgage. Flexibility was essential, because no plan survived contact with reality. Determination, because ventures can and do fail; the key is to see it as a learning experience. (“Ventures fail, entrepreneurs do not.”) And luck, of course. One of the pleasures of these gatherings is meeting old friends. I ran into S. Vittal, my IIM/A classmate who I hadn’t seen since we left the institute. Vittal, Ambi and I were among the most senior alums present — though there was one alumnus who had us beat by nearly a decade! This entry was posted in General and tagged IIM Americas, IIM USA Inc, IIM/A, Pinnacle. Bookmark the permalink.